The Kids Diving Pool Toys - Jellyfish Sinkers can be dropped into swimming pools to begin an assortment of diving games, counting activities, races, and more! 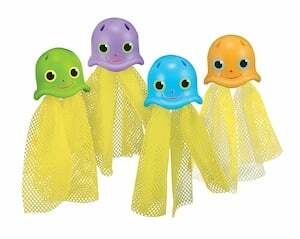 These four brightly colored kids pool toys feature the adorable designs of jellyfish and have mesh bottoms that will delight children as young as five. These diving pool toys inspire a lot of fun in the swimming pool and inspire younger swimmers' imaginations. Make any of these activities into a contest by timing each player as he/she completes the task. Whoever finishes the challenge fastest is the winner! Throw all four sinkers in the pool, then quickly swim to catch as many as you can before they land on the bottom. Retrieve the jellyfish from the bottom of the pool one at a time, and in numerical order. If you pick one up out of order, throw it back and try again! Try to pick up each jellyfish without getting "stung" by its tail. If you touch the tail, drop the jellyfish back into the water and try again.